This is our story; it’s the story that we all know bits of, the story that sometimes gets exaggerated, muddled, or confused in the telling and retelling; it’s the story that we want others to read after we cease to exist. This is a book that explains why we are the way we are and how completely avoidable the damage that we all carry really was. This is a tale of corporate greed, of deals done in smoke filled back rooms, far away from the prying eyes of journalists or our legal representatives. Astonishingly, it has taken until now to put the pieces together. The state level corruption surrounding the decision to end the trial went up to and included the federal president’s office. This is not assumed or implied, it is meticulously documented with primary evidence that has never before seen the light of day. Credit for this must go to Tobias Arndt, who spent countless hours ferreting around in German archives looking for smoking guns. He found a whole armoury of them, due in part to the German fixation for documenting every detail, even of telephone conversations that, in other countries, would have been deniable and no record made. Thankfully, the culpability of the German state has been taken up by a group of campaigners who are working very hard to ensure that Germany ‘does the right thing’ by those of us who have survived thalidomide. Thanks to the authors, we now know that we are almost certainly the tip of a huge iceberg, and that thalidomide affected approximately 175,000 people. 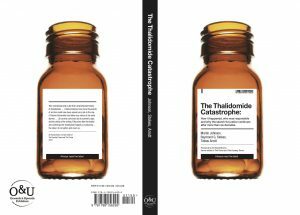 We also learn that the effort to push thalidomide into more and more markets for a variety of conditions went on almost unchecked by the thalidomide catastrophe itself. As early as 1965, an Israeli doctor was being supplied with thalidomide tablets for experimental use on leprosy patients. Even as prosecutors were preparing indictments for Grünenthal’s executives and Chief Scientist, the company was busily filing patents for these new ventures, preparing to visit the same tragedy on people in the developing world, many of whom don’t have the resources to fight back.